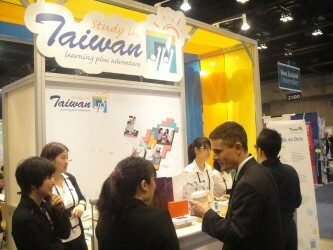 A delegation with 40 members from 19 universities represents Taiwan to attend the 65th NAFSA Annual Conference and Expo in St. Louis during May 26 -31, 2013. Association of International Educators was founded in 1948. It is a National Association of Foreign Student Advisers to promote the professional development of American college and university officials, and to emphasize the importance of networking of international educators’ integration. Its members include academic institutions, government agencies and private organizations. The association changed its name to the National Association for Foreign Student Affairs because its scope expanded to cover: admissions personnel, English-language specialists, as well as the community volunteers who are key persons in assisting international students get familiar with American college life. NAFSA is one of the leading professional associations dedicated to international education with the mission of advancing international education and global workforce development. The 65th NAFSA Annual Conference and Expo defined the conference theme as “Ideals and Impact in International Education”. It has been held at America’s Center in St. Louis City, Missouri from May 26 to 31, 2013. It brought together more than 8,000 professionals in the field of international education for five packed days of training workshops, educational sessions, networking opportunities, and special events. NAFSA's annual conference provides a multitude of educational offerings for international education professionals at all levels of experience and in every specialty. A delegation with 40 members from 20 universities of Taiwan attended the 65th NAFSA Annual Conference and Expo in St. Louis during May 26 -31, 2013. The purpose of this Taiwan delegation is to promote the international cooperation between the universities in Taiwan and their counterparts in the world. In addition, they not only encourage global students to study in Taiwan but also recommend foreign education institutions recruit international students from Taiwan. The Education Division, Taipei Economic and Cultural Office in Houston on behalf of the Ministry of Education in Taiwan arranged a dinner to welcome the Taiwan delegation along with the delegation coordinator, the Foundation for International Cooperation in Higher Education of Taiwan.